Helen Oyeyemi’s writing is gorgeously painterly and wryly, sometimes wickedly, funny. Passion ripples under the characters’ skin, and reminds us that boundaries and societal rules are often less natural than the yearnings that drive us. Contemporary fictions hinged on social media sit alongside dark fairytales that feel eons old, and characters swim from one tale to emerge as cameos in others. It further deepens the sense of entering a fully formed world where history and present blend, and nothing matters more than the characters’ own foibles. In one of the eeriest stories, Presence, we’re invited to consider the many layers between real and unreal, as a couple undergo a pseudo-scientific experiment that succeeds perhaps a little too well. Buildings, gardens, libraries, (plus one particular dog, and one not-a-wolf) and above, all keys, seem as sentient as the human protagonists, with all contributing to the dark tapestry of Oyeymi’s writing, where edges are uncertain and realities mesh together. In many the story arc splinters into multiple asides that leave the reader with a sense that they’ve accidentally eavesdropped on a compelling anecdote, but missed some of the clarifying points along the way. In truth, it all seems far larger than the confines of the pages would suggest. Tantalising tendrils stream outwards in all directions, inviting us to believe that no tale ends with its final full stop, and that your initial understanding of a story is unlikely to be your last. 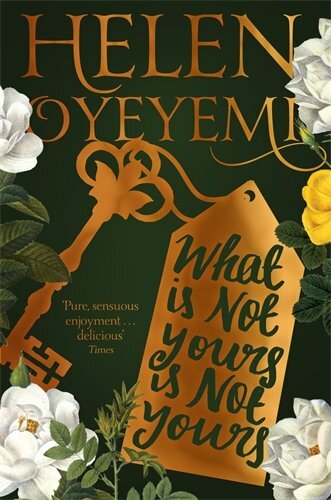 What Is Not Yours Is Not Yours by Helen Oyeyemi is published by Picador and is available to buy from Amazon. This entry was posted in Reviews and tagged Helen Oyeyemi, Picador, short story competitions, What Is Not Yours Is Not Yours by Judy. Bookmark the permalink.